Special parts | NAC-NAGAHORI INDUSTRY CO., LTD. is a quality manufacturer of Quick Couplings, Impact Sockets and Screwdriver Bits. 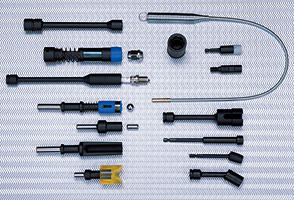 NAGAHORI INDUSTRY CO., LTD. is a leading manufacturer of Quick Couplings, Impact Sockets and Screwdriver Bits. This is a page of special parts. NAC/NAGAHORI INDUSTRY CO., LTD is good at specially designed products of Quick Couplings, Impact Sockets and Screwdriver Bits. Please tell us your requests and your problems. We show here the exmaples of the special products and the technologies. Our motto is " efficiency improvement". We are proud of rich selection of products, and the excellent quality. Our specially made products always relrect the customers' needs correctly, and have supported various industrial projects and production lines. Our original technology and the experience have lead in the production of special items. We here show the examples of specially made products. They are the samples of the best application upon your requests. Please contact us freely for made-to-order Impact Sockets and Screwdriver Bits.